EVERYBODY knows that the collapse of the financial system in 2008 was hugely costly for Western economies. But finance was taking a heavier toll on the economy even before Lehman Brothers went under. That is the conclusion of a new paper by Guillaume Bazot of the Paris School of Economics which takes a different approach to measuring the overall cost of finance. Usually economists measure the contribution of the financial-services industry to GDP in terms of the “value added”, a measure which focuses on fees and spreads. Bankers typically make money by charging a higher rate for loans than they pay to depositors: the so-called 3-6-3 model (borrow at 3%, lend at 6% and be on the golf course by 3pm). The trickier question is whether this much-expanded financial sector has become more efficient. There are some positive signs. The explicit cost of dealing in securities (in the form of commissions and bid-offer spreads) has come down. However, for the big institutions, it is much harder to judge the market impact of their dealing: prices may move sharply against them when they try to buy or sell in bulk. Investors also have access to low-cost fund management in the form of tracker and exchange-traded funds, although the past 30 years have also seen the rise of higher-charging private-equity and hedge funds. Mr Bazot calculates a unit cost for finance by comparing the sector’s income with the stock of financial assets—“the real cost of the creation and maintenance of one euro of financial service over one year”. He finds that, outside France (where it has been stable), the unit cost has increased over the past 40 years; a 2012 paper by Thomas Philippon of New York University found a similar result for America. This is slightly surprising, given the low level of interest rates. Historically, banks have performed best in periods of high interest rates, as they have been able to increase their spreads, charging borrowers a higher rate without compensating depositors (who are very slow to change accounts) to the same extent. Mr Bazot did find a surge in unit costs in the late 1970s and early 1980s when interest rates were high. But in more recent times unit costs have not fallen as might have been expected, given the low level of interest rates since 2000. Instead the capital-market activities of the banks seem to have pushed costs higher. The paper is a useful contribution to the debate about the role of the financial industry in the global economy. 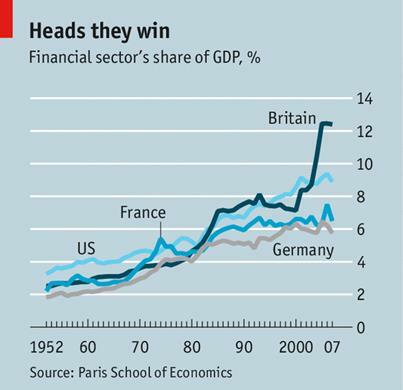 What justifies the high incomes earned by bankers and fund managers? One could argue that they have created a lower cost of capital for business in the form of low bond yields and high equity valuations. But that is a tricky case to make: low yields are more the consequence of central-bank policy and the low level of inflation. An alternative view is that these higher incomes are what economists call rents: excess incomes earned by those with a privileged economic position. The financial industry is protected because governments and central banks will act to rescue it when it falters, in a way they would not do for chemicals, say. And the sector may also benefit from asymmetric information: some of the products it sells are highly complex and clients may not be aware of the full cost until well after a sale is made. The central question that the finance industry needs to answer is this: why has its increased importance been associated with slower economic growth in the developed world and a greater number of asset bubbles?